Ethnobotanical Leaflets 14: 721-42, 2010. Ethno-Medicinal Profile of Different Plant Parts of Calotropis procera (Ait.) R. Br. The present� paper reviews the literature on recent ethno medicinal uses of every plant part of Calotropis procera (1968-2009) and its medicinal properties used for the treatment of various ailments as in the case of many types of fevers, rheumatism, indigestion, cough, cold, eczema, asthma, elephantiasis, nausea, vomiting and diarrhea, etc. The review includes accounts of medicinal values of all parts of the plant that have been used in folk medicine as a remedy. The name and parts of the plant studied, the spectrum of activity, and methods used are discussed in this review paper. Key words: Calotropis procera; traditional medicines; ethno-medicinal use. �������� The herbal medicines occupy distinct position right from the primitive period to present day. The ethnobotanical pharmacology is as old as man himself. These medicines have less side effects and man can get the herbs easily from nature. India being a tropical country is blessed with vast natural resources and ancient knowledge for its judicious utilization. However, in order to make these remedies acceptable to modern medicine, there is a need to scientifically evaluate them, to identify the active principles and to understand the mechanism of action (Ashok Vaidya, 1998). Calotorpis procera in India holds a pride of place largely because of its other uses and economic values. The genus Calotropis R.Br. (Asclepiadaceous) is distributed in tropical and subtropical regions of Asia and Africa (The wealth of India, 1959). It is represented in India by two species viz. C. procera and C. gigantean. Calotropis procera (Ait.) R. Br., a wild growing plant of family Asclepiadaceae, is well known for its medicinal properties. Different parts of this plant have been reported to exhibit anti-inflammatory, analgesic, and antioxidant properties. It is found in most parts of the world in dry, sandy and alkaline soils and warm climate and is more common in south western and central India and western Himalayas. It is found in waste lands and grows as a weed in agricultural lands. In ancient Ayurvedic medicines the plant Calotropis procera was known as �Rakta arka�. ���������� Morphologically the plant is erect, tall, large, much branched and perennial shrub or small tree that grows on a height of 5.4m, with milky latex throughout. Bark is soft and corky, branches stout, leaves sub sessile, opposite, decussate, broadly ovate, oblong, elliptic or obovate, acute, thick, glaceous, green coloured with fine cottony pubescent hair on young. Flowers in umbellate cymes and tomentose on young. Seeds broadly ovate, acute, flattened, minutely tomentose, brown coloured and silky. ����������� Most of the research papers, research articles and review papers were consulted and compiled. The useful material regarding the information of ethno medicinal aspects of C. procera were collected from time to time and summarized in present paper. This paper recovers the traditional medicinal values of each and every part of the selected the plant (C. procera). ��������� A number of research papers, articles and review papers treat the ethno medicinal aspects of this plant. Table 1, 2 and Fig. 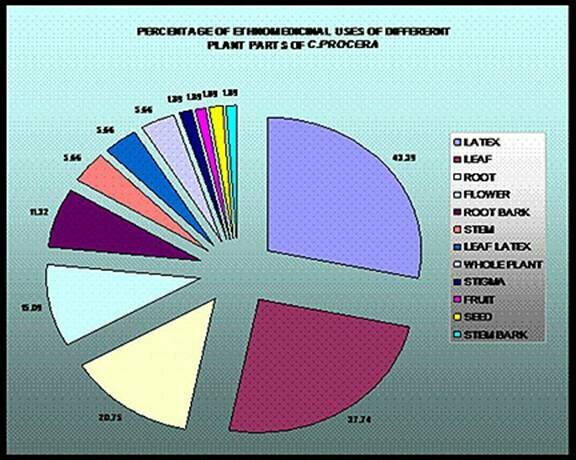 1 showing the percentage of ethnomedicinal uses of different plant parts of C. procera. Table 1. Ethno medicinal uses of different plant parts of C. procera. Extract of root is taken orally by the tribal ladies. The root powder is mixed with butter and this ointment is applied to. The latex applied locally During the course of this treatment, prepared from the whole plant Swertia Chirayita is also taken. Leaf extracts mixed with oil on heat. Young leaves are crushed and the juice is expressed on the palms of the person venomated. It is allowed to be there for five minutes and is sniffed. If immediately sneezing starts the snake is declared to be poisnous. The leaves are heated and bandage is made. Powder of 5g dried leaves mixed with gur given orally before sunrise for 5 days. Latex is, either taken internally or locally to the mouth of uterus with the aid of a stick well coated with juice. Latex of the plant is filled in spaces between nails and finger tips of patient twice daily for a few days to cure conjunctivitis. Latex is used in the treatment of. Latex and leaves mixed with turmeric, honey and karanji was applied as a paste. Pills of the size of a black gram are made from the paste obtained by mixing 6gm flower buds with 7-8 black pepper seeds and 3gm salt. Two pills are given twice daily for three days. Take 3 gm of Calotropis seeds, 18 gm of red chili seeds and 6 gm opium. Grind all of these and mix it in one teaspoon of ginger and half cup of onion water, if unavailable then use syrup of sugar and citrus medica water..
To treat common diseases such as fever, rheumatism, indigestion, cold, eczema and diarrohea. In boils and also to remove thorn from body. Is used as coloring material. Were found to have anticanceractivity against human epidermal carcinoma of the nasophyrnx tissue culture. Induced acute and chronic liver injury by carbon tetrachloride. Eczema, leprosy, elephantiasis, asthma, cough and rheumatism. Is locally applied in elephantiasis. Is used to treat diarrhea and dysentery and it is an excellent substitute for ipecac. Traditionally it is used to treat cholera, extracting guinea worms and indigestion. For the treatment of skin diseases, enlargements of abdominal viscera and intestinal worms. To people suffering from leprosy. Used as tonic, antispa modic, expectorant and in large doses emetic. Used as tonic and stimulant. All patients suffering from migraine headaches got relief. As a nematicide in vitro and in vivo. Bones/ parts affected from Sinus fistula. Hydrocede, headache, severe body pain, malarial fever and convulsion. In rheumatism, gout and to relieve pains. Against rheumatism, asthma and also used as sedative. To cure flatulence, anorexia, indigestion and intestinal worm infestation. Sores, skin diseases, inflammation and rheumatic joints. To treat pain in any part of the body. Treat scorpion and snake bite. Leaf latex is applied on bitten area. For Scorpion bite. Fresh leaves are cut and the excluding latex applied to affected area. Black scars on face; boils, cold, cough, asthma, ear ache, eczema, skin eruptions, inflammatory lesions, pain of the body, rheumatism, syphilis, leprosy and oedema. Inserted in to painful tooth cavities and applied to various skin complaints. Cutaneous diseases such as ringworm, syphilitic sores and leprosy. Anti rabies and also in the treatment of toothache and cough. Purgative and used in dysentery. Various skin diseases also act as purgative. Relieve inflammation and snake bite to neutralize poison. Tooth ache, ringworm and also for removing face darkness. To get relief from migraine. To cure cholera and severe dysentery. In piles and asthmatic problems. Table 2. Percentage of ethno medicinal uses of different plant parts of C. procera against total number of uses. Fig.1. Graphical presentation of ethno medicinal uses of different plant parts of C. procera. Fig.2. Graphical presentation of ethno medicinal uses of different plant parts of C. procera. This ethno-medico-botanical study on the plant Calotropis procera has revealed the enormous diversity of its medicinal uses and popular use of the plant C. procera for a wide range of common ailments like fevers, rheumatism, indigestion, cough, cold, eczema, asthma, elephantiasis, nausea, vomiting and diarrhea. Either the whole plant or a plant part used singly or mixed with other plant materials to enhance the efficacy. ����������� Plant based drugs have been in use against various diseases since the time immemorial. The primitive man used herbs as therapeutic agents and medicament, which they were able to procure easily. The nature has provided plant wealth for all living creature, which possess medicinal virtues (Bhatti et al, 1998). Medicinal plants are an important source of drugs in traditional system of medicine (Sher and Hussain, 1998a). They are valuable natural resources and regarded as potentially safe drugs. In addition, they are playing an important role in alleviating human suffering by contributing herbal medicines in primary health care system of rural and remote areas where more than 70% of population depends on folklore and traditional system of medicines. The reason for their popularity is due to high cost of allopathic medicines and side effects. Medicinal plants have been used since prehistoric period for the cure of various diseases. Since these are in common use by the local people and are of great importance that�s why a lot of people are engaged in the trade of important medicinal herbs throughout the world (Elisabetsky, 1990). Especially, people living in villages have been using indigenous plants as medicines since ages because this knowledge transfers from generation to generation and is based on life long experiences. Besides, the villages are far away from cities and mostly lack proper health facilities (Shinwari and khan, 2000). ��������������� This field is well established and a lot of work has been done worldwide. Radhakrishman et al (1998) reported ethnobotanical information on Ulteria salicifolia, a monotypic species endemic to south Western Ghats of peninsular India and gave its taxonomic identity, distribution pattern and affinity to an allied genus for the first time. Beyra et al (2004) carried out an ethnobotanical survey from Camaguey, Cuba and reported 111 plant species belonging to 96 genera and 55 families from the study area. These species are used in the treatment of 173 local health problems in the study area. Bondya & Sharma (2004) conducted a survey of medicinal plants used in diabetes in Jharkhand and collected 11 plant species with remarkable uses. Buckingham (1991) reported that there are total of 2,50,000 species of flowering plants in the world, much less than animal species (5-10 million) however, plants contribute to our lives more than animals mainly due to their extra ordinary array of diverse classes of biochemicals with a variety of biological activities. Ji et al (2004) reported the medico-ethnobotany of Nujiang, Northwest Yunnan, and China. They described 52 medicinal plant species belonging to 32 families used for the treatment of various human ailments. Among them, 11 species were reported as rare and 16 were commercially utilized. ��������������� The indigenous traditional knowledge of herbal plants of communities where it has been transmitted orally for many years is fast disappearing from the face of world due to transformation of traditional culture. The people, who are native to the area in which the plants occur, use around 90% of the medicinal species (Baquar, 1989). This is indicative of the vast repository of knowledge of plant medicine that is still available for global use, provided of course that it does not get lost before it can be tapped or documented. Traditional and indigenous medical knowledge of plants, both oral and codified, are undoubtedly eroding (Mujtaba and Khan, 2007). In the present scenario, traditional knowledge system in our country is fast eroding and there is an urgent need to inventoried, record all ethno-botanical and cultural information among the diverse ethnic communities before the traditional cultures are completely lost. Therefore, documentation of information on ethno-medicinal uses will help in conserving the knowledge. A comprehensive database of the plants used for various purposes could be saved for the forthcoming generations. This information about medicinal values of C. procera has paramount importance in life and how these ethno herbal data have key role in life. Moreover, it can be initiative for further phytochemical and pharmacological investigations about the medicinal use of the plant, which may be a step ahead towards the new drug development. 1. Abdullah, H.M. 1975. Pakistan Wa Hindustan Ki Jari Bootian, Idar-e-Matbout-C- Sulemani Urdu Bazar Lahore,� 29-67. 2. Ahmad, H., Ghulam R.B. and Latif, A. 2004. Medicinal Flora of the Thar Desert: An overview of problem and their feasible solutions. Zonas Aridas N08, Pakistan publishers. 3. Ahmad, I., Beg, Z.A. 2001. Antimicrobial and phytochemical studies on 45 Indian Medicinal Plants against multidrug resistant human pathogens, J. Ethnopharmacology, 74, 13-123. 4. Ajibade, L.T., Fatoba, P.O., Raheem, U.A. and Odunuga, B.A. 2005. Ethno medicine and primary health care in Iiorion, Nigeria, Indian J. traditional knowledge, 4(2): 150-158. 5. Anis, M. Sharma, M.P. and Muhammad, I. 2000. Herbal ethno-medicine of the Gwaliar Forest Division in Madhya Pradesh, India, Pharmaceutical Biology, 38(4): 241-253. 6. Awan, H.M. 1986. Kitab-Mufridat Al Ma'roof Khawasul Adwiyat, Sheikh Ghulam Ali & Sons Ltd., Karachi, pp. 59-60. 7. Badruzzaman, S.M., Alam, M.M. and Wazahat, H. 1989. Traditional treatment of skin diseases in U.P., India, Economic Botany, 43(4): 480-486. 8. Baquar, S.R. 1989. Medicinal and Poisonous Plants of Pakistan. Printas Karachi, Pakistan, pp. 343-344. 9. Basu, A., Sen, T., Ray, R.N. and Nag, A.K.� Chaudhuri 1992. Hepatoprotective effects of Calotropis procera root extract on experiment liver damage in animals, Fitoterpia, 63, 507-514. 10. Beyra, A. Del, M., Leon, C., Iglesias, E., Ferrandiz, D., Herrera, R., Volpato, G., Godinez, D., Guimarais, M. and Alvarez, R. 2004. Ethnobotanical studies of medicinal plants in the province of Camaguey (Cuba), Anales Del Jardin Botanico De Madrid, 61(2): 185-203. 11. Bhatt, D., Joshi, G.C. and Tiwari, L.M. 2009. Culture habitat and ethnomedicinal practices by bhotia tribe people of Dharchula region of Pithoragarh District in Kumaun Himalaya, Uttrakhand, Ethnobotanical leaflets, 13, and 975-83. 12. Bhatti, G.R., Qureshi, R. and Shah, M. 1998. Ethnobotany of Calotropis procera�� with especial reference to the people of Nara Desert, Scientific Sindh, Pub. Salu, Khairpur, 5: 13-22. 13. Bhogaonkar, P.Y. and Kadam, V.N. 2007. Herbal antidotes used for snakebite by banjara people of� Umarkhed region in Maharashtra, India, Ethnobotany, 19, 71-78. 14. Bondya, S.L. and Sharma, H.P. 2004. Ethnobotanical studies on plants used in diabetes (Madhumeha) under the Baharagora block of Jharkhand, Ethnobotany, 16(1/2): 139-140. 15. Buckingham, J. 1991. Dictionary of natural compounds, Chapman and Hall U.K., 14-20. 16. Chopra, T., Abrol, B.K. & Handa, K.L. 1983. Medicinal Plants of the arid zone -t Today and tomorrows, printers and publishers, New Delhi, 25. 17. Dhar, M.L., Dhar, M.M., Dhawan, B.N., Mehrotra, B.N. and Ray, C. 1968. Screening of Indian medicinal plants for biological activity, Part I,�� Ind. J. Exp. Biol. 6, 232-247. 18. Dhiman, A.K. 2007. Conservation of some useful medicinal plants of Haridwar District in Uttaranchal State. Medicinal plants: Conservation, Cultivation and Utilization, 147-166. 19. Elisabetsky, 1990. Plants used as analgesics by amazonian cabocols, Int. J. crude drug research, 28, 309-320. 20. Fatima, M.D. 2007. Patricia Franca De Freitas, Jose Maria Barbosa Filho, Synopsis of the plant known as medicinal and poisnous in northeast of Brazil, Brazilian Journal of Pharmacognosy, 17(1): 114-140. 21. Flatie, T.,�� Gedis, T., Asres, K. and Mariam, T.G. 2009. Ethnomedicinal survey of Berta ethnic group Assosa zone, Benishangul- Gumaz regional state, mid West Ethiopia, J. Ethnobiology and Ethomedicine, 5:14 . 22. Galav, P.K., Nag, A. and Katewa, S.S. 2007. Traditional herbal Veterinary medicines from Mount Abu, Rajsthan, Ethnobotany, 19, 120-123. 23. Giday, M. 2001. An ethnobotanical study of medicinal plants used by the Zay people in Ethiopia, CMB: Skriftserie, Uppasala, 3, 81-99. 24. Jain, Anita. Katewa, S.S., Galav, P.K. and Nag, Ambika 2007. Unrecorded ethnomedicinal uses of biodiversity from Tadgarh Raoli wildlife sanctuary, Rajsthan, India, Acta Botanica Yunnanica, 29 (3):, 337- 344. 25. Jain, Anita, Katewa, S.S., Galav, Praveen and Nag, Ambika, 2008. Some therapeutic uses of biodiversity among the tribals of Rajasthan, India, J. traditional Knowledge, 7 (2): 256-262. 26. Jain, P.K., Verma, R., Kumar, N. & Kumar, A. 1985. Clinical trial of Arka-����������������������������������������������� Mulatwak-Bark of C. procera -a preliminary study, J. Res. Ayur. Sidha 6, 88 -91. 27. Jain, P.K., Kumar, N., Verma, R. 1985. Clinical trials of Arka Mula Tuvaka, bark of Calotropios procera Ait. (R.Br.) on atisar and Pravihika- A preliminary study, J. research in Aurveda and Siddha, 6, 89-91. 28. Jan, G., Khan, M.A. and Gul, F. 2009. Ethnomedicinal plants used against jaundice in Dir Kohistan Valleys (NWFP), Pakistan, Ethnobotanical leaflets, 13, 1029-41. 29. Jan, S., Ajabkhan, M., Uddin, S., Murad, W., Hussain, M. and Ghani, A. 2008. Herbal Remidies used for Gastrointestinal Disorders Kaghan Valley, Nwep, Pakistan, Pak. J. Weed Sci. Res., 14(3-4): 169-200. 30. Jasrai, Yogesh, T., and Chaplot, B.B. 2003. Traditioal Knowledge on plant conservation linked to Beliefs and Religious Rites, In Asian Agri History,� Asian Agri History foundation, 319-325. 31. Ji, H., Shengji, P. and Chunlin, L. 2004. An ethnobotanical study of medicinal plants used by the Lisu people in Najiang, Northwest Yunnan, China, Econ. Bot., 58 (Suppl. ), 253-264. 32. Joshua, Kayoed. 2006. Conservation of indigenous medicinal botanicals in Ekiti State, Nigeria, J. Zhejiang University Science B, 7(9): 713-718. 33. Kew, F. 1985. The useful plants of west tropical Africa, Vol. (1), Families A-D Edition 2 (Ed Burkill, H.M.) Royal Botanical Gardens, 219-222. 34. Khan, B. and Kamran, S.H. 2006. Community Based Forest conservation in Upper DIR District, NEWP, and Final progress report, Nov. 2005- Oct 2006. 35. Khan, F.M. 2009. Ethnoveterinary medicinal usage of flora of greater Cholistan Desert Pakistan, Pak. Vet. J., 29(2): 75-80. 36. Khirstova, P. and Tissot, M. 1995. Soda Anthroqinone pulping of Hibiscus sabdariffa (Karkadeh) and C.procera from Sudan, Bioresource Technology, 53: 672-677. 37. Kumar, Ashwini 2009. Some important Medicinal plants from different regions of Rajasthan, Scientific Biology, Science. 38. Kumar, V.I., Basu, N. 1994. Anti-inflammatory activity of the latex of Calotropis procera, J. Ethnopharmacology, 44, 123-125. 39. Kumar, V.L., Arya, S. 2007. Medicinal uses and pharmacological properties of Calotropis�� procera, In: Govil J.N.� Editor, Recent Progress in Medicinal Plants, Houston, Tex, USA: Studium Press, 11, 373�388. 40. Maliya, S.D. 2007. Traditional fruit and leaf therapy among Tharus and indigenous people of district Bahraich, India, Ethnobotany, 19, 131-133. 42. Morton, J.F. 1981. Medicinal plants of Middle America, Springfield, Illinois: Charles, C. Thomas. 43. Mujtaba, G., Khan, M.A. 2007. Check list of medicinal plants of siran valley������������������������ mansehra-pakistan. Leaflet Quaid-I-Azam University, Islamabad-Pakistan, pp.� 15. 44. Muthuswamy, R. and Abay, S.M. 2009. 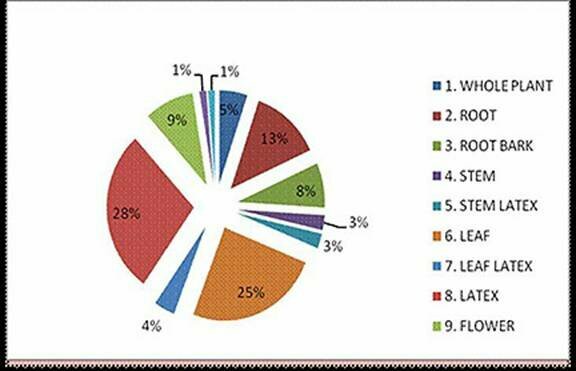 Ethnomedicinal Survey of folk drugs used in Bahirdar Zuria district, Northwestern Ethiopia, Indian J. Traditional Knowledge, 8(2): 281-284. 45. Negi, C.S., Navtiyal, S., Dasila, L., Rao, K.S. and Maikhuri, R.K. 2002. Ethnomedicinal plant uses in a small tribal community in a part of central Himalaya, India, J. Hum. Ecol. 14 (1): 23-31. 46. Bhogaonkar, P.Y. and Kadam, V.N. 2007. Herbal antidotes used for snakebite by Banjara people of Umarkhed region in Maharashtra, India. Ethnobotany 19: 71-78. 47. Pandey, B.P. & Anita 1990. Economic Botany, S. Chand & Company Ltd., Ram Nagar, New Delhi-ll0055, 169-292. 48. Parrota, J.A. 2001. Healing of plants of Penninsular�� India, AB international Wallingford, U.K., 944. 49. Patil, S.B., Naikwade, N.S., Kondawar, M.S., Magdum, C.S. and Awale, V.B. 2009. Traditional uses of plants for wound healing in the Sangli District, Maharashtra, I. J. Pharm. Tech. Research. 1(3): 876-878. 50. Prasad, G. 1985. Action of Calotorpis procera on migraine (Family Asclepiadaceae), J. National integrated Medical association, 27, 7-10. 51. Radhakrishan, K., Pandurang, A.G. and Pushpanganda, P. 1998. Uteria salicifolia, A new ethnobotanical record from Kerala, India, Fitoterapia, 69(5): 403-405. 52. Rai, M.K., Pandey, A.K. and Acharaya, D. 2000. Ethnomedicinal plants used by Gond tribe of Bahanalehi District Chhinwara, M.P. J. of nontimber forest, 7(3/4): 237-241. 53. Rasik, M.� Raghubir, R. Gupta, A.� Shukla, A., �Dubey, M.P., Srivastava, S., Jain, H.K. and Kulshreshta, D.K. 1999. Healing potential of C. procera on dermal wounds in Guinea pigs, J. Ethnopharmacol., 68 (1-3): 261-266. 54. Reddy, V.B. 2008. Use of various bio fencing plants in the control of human diseases by Lambda Tribe Inhabiting Nagaland District, A.P., India, Ethnobotanical Leaflets, 12, 520-523. 55. Rehman, E.U. 2009. Indiginous knowledge on medicinal plants , Village Baralikass and its allied areas, District Kotli Azad, Jammu and Kashmir, Pakistan, Biodiversity Network J & K, �. 56. Said, H.M., Barkati, M.A. & Khalil, A.K. 1996. Mufeed Ghizaen Dawain, Bai-tal Hikmat, Mohammad Bin Qasim Avenue, Madinat -al-Hikmat, Karachi-74700, 10-14. 57. Sen, S.K. and Behra, L.M. 2007. Ethnomedicinal Plants used in touch therapy at Bargarh district of Orissa, Ethnobotany, 19, 100-104. 58. Shah, S.R.U., Hassan, G., Rehman, A. and Ahmed, I. 2006. Ethnobotanical studies of the flora of the district Musakhel and Barkhan in Balochistan. Pakistan, Pak. J. Weed Sci. Res. 12(3): 199-211. 59. Sher, H. and Hussain, F. 1998. Income generation from the trade and cultivation of medicinal plants for local communities in district Swat, Pakistan. Proc: Wild plants resources of Northern Pakistan, workshop PFI, Peshawar May 11-12, 1998a, 48-51. 60. Shinwari, M.I. and Khan, M.A. 2000. Folk use of medicinal herbs of Margalla hills national park, Islamabad, J. Ethnopharm. 69, 45-56. 61. Showkat, R.M. 2007. Different system of classification of crude drugs,Alternate system of medicine, Pharmacognosy. 62. Smith, H.F., Woerdenbag, H.J., Singh, R.H., Meulenbeld, G.J., Labadie, R.P. and Zwaving, J.H. 1995. Ayurvedic herbal drugs with possible cytostatic activity, J.� Ethnopharm, 47, 75-84. 63. The Wealth of India, Raw Materials, Vol. II, CSIR, New Delhi, 1959,� 20-23. 64. Vaidya, A. 1998. Pharm. Res. India (Pharm a Pulse- Suppl), 44-45. 65. Zabihullah, Q. Rashid, A. and Akhtar, N. 2006. Ethnomedicinal survey in Kot Manzorag Baba Valley Malakand Agency, Pakistan, Pak. J. Pl. Sci. 12(2): 115-121.